The Kite Project | It only takes a little wind for a kite to take flight. The gig aftermath… 🙂 Wow we had a great time at The Kite Project launch at Rookies last night! Woke up super happy and with one thought on my mind… WE DID IT! WE DID IT! WE ACTUALLY DID IT! Now remember… SHARING IS CARING! If you enjoyed the video, your friends might too so please pass it around! MEGA THE KITE PROJECT STATUS INCOMING! Thank you Malta Arts Fund! You help make dreams a reality! Thank you Janice Debattista & Cheryl Camilleri for bringing the layered vocals on the EP to life! Thank you Jodi for a fabulous performance and The AV Warehouse for the great sound! Thank you so much to the ever-patient Martin Bonniċi from Shadeena – mentor of the year and fantastic supervisor and video editor. Thank you Nina for putting us in touch in the first place! Thank you so much Polina for helping me out with the drawing and animation, Mark for helping with storyboarding when I got stuck, David for all the times Polina and I had animation+soup or sushi nights at your place! Thank you Shaun for the photos, Lorleen and Jean Claude for the HD footage shot in August, and Martha for djing after-hours and just being there always, no matter what Jackie… who I could just leave my life to, to organise and everything will turn out great! I can now say that I have an album behind me – and its all thanks to this amazing support network around me – I am nothing without you! TO ALL I SAY – If you have a dream… find the energy, people and means to just go ahead and DO IT! This is The Kite Project! ONLY ONE WEEK TO THE LAUNCH…. AAAAAAAAA! 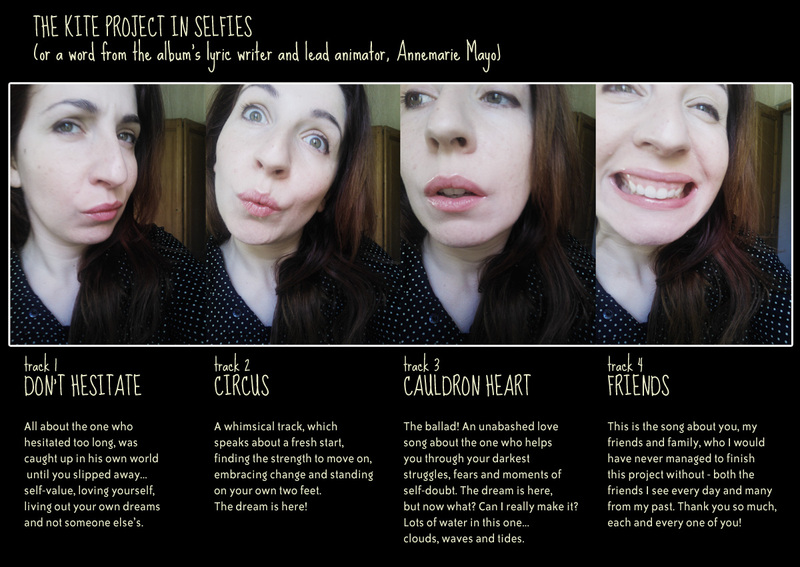 The Kite Project’s EP in SELFIES! This is the last animation I will be posting before the video is released… so there will hopefully be some sequences you haven’t seen.